Generation:7 Hispanic students have a very different generational composition than their non-Hispanic peers. Non-Hispanic public school students are overwhelmingly (87%) third-generation Americans and higher (native-born citizens with both parents also having been born in the U.S.). In comparison, only about one-third (35%) of Hispanic public school students are third-generation Americans or higher. Almost two-thirds (65%) of Hispanic public school students are either immigrants themselves (first generation) or the children of immigrants (second generation). Nearly half (48%) of Hispanic students are U.S.-born children of immigrants, and slightly less than one-fifth (17%) of Hispanic students are immigrants themselves. Race:8 Two-thirds (66%) of all students enrolled in public schools identify themselves as being white. Among non-Hispanic students, seven-in-ten (70%) identify themselves as white. In comparison, about half (51%) of Hispanic students report being of white racial identity. 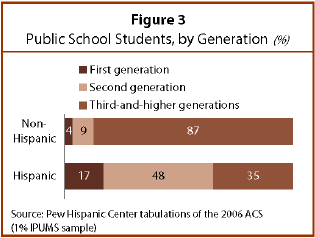 There are some differences in the racial identity of Hispanic students by generation. Although the share of Hispanic students who self-identify as white is approximately 50% in each generation, the share who identify as being of two or more racial origins is greater in the third-and-higher generations than in the first generation. About 10% of Hispanic students in the third-and-higher generation report being of two or more racial origins. In comparison, only 3% of Hispanic second-generation students report being two or more races and 1% of foreign-born Hispanic students report multiple racial identity. National Origin of Hispanic Students:9 More than two-thirds (69%) of Hispanic public school students are of Mexican origin. Although Mexican-origin students comprise the greatest share of Hispanic public school students in each generation, the Mexican share of students decreases among the third-and-higher generation. Nearly three-quarters of first- and second-generation Hispanic students (72% and 74%, respectively) are of Mexican origin. Only 60% of the third-and-higher generation Hispanic students are of Mexican origin. After those of Mexican origin, students of Dominican (4%) and Salvadoran (4%) origin are the largest groups of first- and second-generation Hispanic students. Among the third-and-higher generation Hispanic public school students, Puerto Ricans (22%) and Cubans (1%) comprise the second- and third- largest groups.